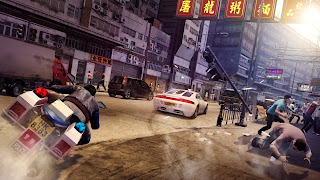 At one point being True Crime: Hong Kong and close to not seeing the light of day, Square Enix picks up the title and re names it to Sleeping Dogs. A game about values, loyalty, fast cars and a city that’s vibrant and full of life. 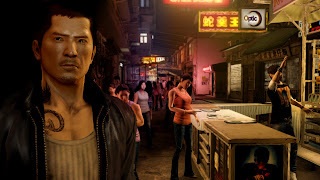 Obviously games such as this are not new looking at similar franchises such as GTA and Saint’s Row, however can Sleeping Dogs become the hit that United Front Games know it can be? Or should it have been left in the dark when Activision dropped it? The player assumes the role of Wei Shen, an undercover cop who is assigned with the task of infiltrating the Triad faction called the Sun On Yee and to take them down from the inside. While in prison for a failed drug bust, Wei meets up with his old childhood friend Jackie Ma who introduces him to Triad Boss Winston Chu, thus allowing Wei access to the society. Wei Shen at the Night Market. The main thing the game wants you to question throughout the story is where Wei’s loyalty truly lies, as he struggles to remember his duty as an officer and keep doing the right thing while at the same time, developing a brotherly relationship with members of the Triad as well as strengthening the bonds with those he knew from his childhood even further. If anything I felt that the story was too short seeing as certain elements could have been expanded on however at the same time extending it any further may have caused unnecessary filler and lowered its overall quality. The actual pacing and sequence of events was quite good giving enough time for the player to understand and make their own decisions based on what was happening. Character interaction felt believable, especially whenever Wei and Jackie converse you feel that older/ little brother mood going on therefore immersing yourself even further into the narrative. If anything there was quite a lot left out in the open that could easily be used in a sequel or even a prequel but as for this specific title, it probably has one of the more better structured storylines compared to other games in the same genre. So Sleeping Dogs is an open world action-adventure game borrows quite a bit from Hollywood films through its epic car chases and fluid free running. Most games in its genre would be expected to have quite a large map however this one doesn’t and in the long run, it probably works better that way by having the gameplay more condensed instead of having the player travel long distances. Of course this doesn’t mean you will get to every destination really quickly so for those people who like to hit the highway in a really fast car, there is more than enough road for you to burn rubber on. Missions are split up into two groups; the one’s you take on for the Sun On Yee and the tasks you’re given by Inspector Teng or Pendrew. You’re given free will to take on whatever mission you feel is available at the time however some Sun On Yee missions may not be available until you further your progress with the police side of things in which the same can happen the other way around. To be honest I felt that they were way too easy in terms of the objectives that needed to be completed, this isn’t helped by the fact that the AI barely put up a good resistance in turn making these simple to complete. The only good chance you can actually fail is during those moments where Wei is required to hack into a system, this is done through an on screen PDA in which you have to try guess a four number combination. I thought this little mini game was interesting and served as a good challenge, especially when you’re faced with a short time limit. 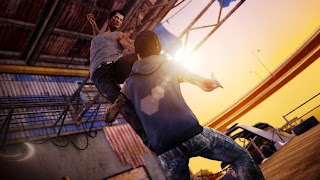 It’s used quite a few times throughout the game but most notably when performing a Drug Bust, where you are required to hack the camera at a hotspot in order to catch the culprit. Driving is encouraged quite a bit here as you can visit car dealers throughout the city and purchase expensive yet fast vehicles. This is coupled by the fact that later on, street races are unlocked in which each has a specification to what class of vehicle is allowed to be used. The two that can be bought are Motorcycles and Cars so if you wish to enter every race, getting all of them from every class is kind of necessary. The races themselves are pretty challenging as it seems that every time you think you have the fastest car, your opponent’s just seems to be that much quicker. The routes themselves test your skills pretty well so don’t expect an easy time from the get go and depending on what your driving, you would have to take in to account how much speed you’re going at when reaching a bend, when to brake and where you’re opponents are adding just a bit more realism to the system. So one way the story and gameplay mix is through the Triad and Cop score you are given at the end of each mission. These are both represented by three logos in which if they are all full, you completed the task properly. I like the idea of it, in the sense that it’s almost giving you the choice in being the person you want to be. Will you complete tasks with absolute brutality or tip toe around it and save as many people as possible? Of course depending on your chosen actions, your end score will be affected. If this was the only use for the Triad and Cop score, then it would be a completely useless mechanic however they go further into this by adding a sort of level up system, where every time you reach a new level, you can learn a new move. These moves are dependent on what side you level up and vary from increasing your damage output to disarming weapons from your opponent. Along with this is also the face meter which you can build by doing favours for people around Hong Kong, building up this meter can unlock new costumes and items to wear in the wardrobe some of which grant extra bonuses to help increase your Triad and Cop levels quicker. A big feature in Sleeping Dogs is the expansive combat allowing you to make use of a different number of combinations to pull off some devastating moves. The system makes use of hitting a button a certain number of times or holding it down for that heavy attack. There’s also a counter in which you can evade the enemy’s attack and perform one of your own. It’s quite similar to what’s offered in Batman: Arkham City although it’s a lot more refined here e.g. When countering if you miss time it, it takes a few seconds for Wei to go back to his normal stance, therefore making you vulnerable to enemy attacks. At the beginning, a standard set of attacks are available to you but as you go through the game, you’re able to unlock new moves that deal a lot more damage. You can do this by either increasing your Triad level or returning the missing Jade statues to Sifu, Wei’s old martial arts teacher. Other extras include small collectibles such health shrines located around the city which increases your overall health meter and lockboxes which contain money and sometimes special items. You can also do karaoke to a number of old school tracks and get treatments to better help your progress e.g. getting a massage will help increase your face meter faster. In a way, Sleeping Dogs is like a mash up of good gameplay seen in different titles and to be honest it’s surprisingly fun to play. Hong Kong is where the game is set and they seemed to bring it to life in Sleeping Dogs. Whether it’s the busy and active Night Market where the many stalls are trying to sell their food and merchandise all the way to the clubs where the people are partying, it’s clear that a tremendous amount of effort was put forward to making sure the environment constantly amazed and made you feel like you were in Hong Kong. Of course a game of this size will come with the random visual glitches but nothing that hinders the overall experience. Textures are of a really high quality and the main character models look great. Hong Kong in all its beauty. There seems to be a good variety of genre’s when it comes to the soundtrack, a lot of which is more noticeable when you’re listening to the radio inside a vehicle. A good blend of hip hop, rap, rock and dub step seem to further enhance any situation you find yourself in but furthermore, it makes getting away from the Cops even more thrilling. The audio just aids the atmosphere perfectly and never seems to be out of place, no matter what is happening. Voice acting is pulled off pretty well and no character ever seems to come across as dry. The way they play off of each other during cutscenes makes it all the more believable. Bringing this title to fruition may have been rough however all the effort put into it seems to have been worth it. The story is clean and easy to understand and Hong Kong looks full of life. The gameplay is fun and never seems to get boring and characters are interesting and have a lot of background. In a way the story could have been extended and certain elements such as the persuasion mechanic could have had a lot more done to it but as a complete package, this is a solid title. 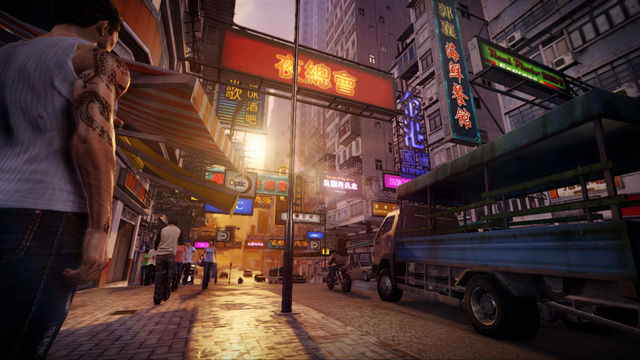 Sleeping Dogs will take you to the dark side of Hong Kong and surprisingly will make you want to stay there.